Aladdin is a musical based on the 1992 Disney animated film of the same name with music by Alan Menken and lyrics by Howard Ashman, Tim Rice and Chad Beguelin. Beguelin also wrote the book. The musical includes three songs written for the film by Ashman but not used there and four new songs written by Menken and Beguelin. The story follows the familiar tale of a poor young man who is granted three wishes by a genie in a lamp, which he uses to woo a princess and to thwart the sultan's evil Grand Vizier. Set in the fictional Arabian city of Agrabah, the characters and setting are Middle Eastern. The animated version was celebrated as Disney's first to feature non-white protagonists. However, the anglicisation of Aladdin and Jasmine drew attention to Disney's lack of authentic representation of ethnically diverse characters. Aladdin premiered at the 5th Avenue Theatre in Seattle in 2011. After several regional and international productions in 2012, the musical was given a Toronto tryout in 2013. It opened on Broadway at the New Amsterdam Theatre on March 20, 2014, to mostly warm reviews and was nominated for five Tony Awards. In November 2010, Alan Menken confirmed that a musical theatre adaptation of the movie was in the works with a book written by Chad Beguelin. The musical premiered in Seattle, Washington, at the 5th Avenue Theatre from July 7 to 31, 2011. Jonathan Freeman, who voiced Jafar in the film, played the role in the stage adaptation. Adam Jacobs and Courtney Reed played Aladdin and Jasmine, despite the characters being Middle Eastern. Additional cast included James Monroe Iglehart as Genie; Clifton Davis as the Sultan; Don Darryl Rivera as Iago; and, playing Omar, Kassim and Babkak, a trio of characters originally conceived by the film's creators but not used, were Andrew Keenan-Bolger, Brian Gonzales and Brandon O'Neill, respectively. Disney's colourblind casting policy meant ethnicity was not considered in the casting process which sparked some controversy as the American Arab Anti-Discrimination Committee received numerous complaints from actors of Middle Eastern descent. The executive director of a US minority rights organisation also drew attention to the show's missed opportunity to feature an underrepresented minority on Broadway. The show was directed and choreographed by Casey Nicholaw. In 2012, productions of the musical played at the Tuacahn Amphitheatre in Ivins, Utah, from June to October 2012 and The Muny in St. Louis in July 2012. In 2012, Aladdin was staged in Manila at the Meralco Theater. Directed by Bobby Garcia and Chari Arespacochaga, it starred Tom Rodriguez as Aladdin and featured Aiza Seguerra as Genie. The musical was staged in Spanish in Bogotá, Colombia, in 2013. Aladdin had a pre-Broadway tryout at the Ed Mirvish Theatre in Toronto, Ontario, from November 2013 to January 2014. Nicholaw again directed and choreographed, with book and additional lyrics by Beguelin, scenic design by Bob Crowley, and costume design by Gregg Barnes. The musical premiered on Broadway on February 26, 2014, in previews and officially opened on March 20, 2014, at the New Amsterdam Theatre, taking the place of Mary Poppins. The show was nominated for five Tony Awards, winning one for Best Performance by a Featured Actor in a Musical for James Monroe Iglehart. The cast album was nominated for the Grammy Award for Best Musical Theater Album. The musical is scheduled to be produced in Hamburg, Germany, in 2015 in partnership with Stage Entertainment. A West End production was confirmed for 2016 at the Prince Edward Theatre in London, taking the place of the revival of Miss Saigon. In July 2015, Disney Theatrical Productions and Tim Rice officially announced that the show would open in the summer 2016 in the West End and that auditions would be held from August through September 2015. In October 2015, it was announced that the show would officially open on June 9, 2016, with previews beginning May 27, and that Trevor Dion Nicholas would be playing the Genie. The official opening was later delayed till June 15, 2016. In November 2015 full cast was announced. Dean John-Wilson would play the role of Aladdin alongside Jade Ewen as Jasmine. Don Gallagher would play Jafar, Peter Howe would join as Iago, Irvine Iqbal as the Sultan, Nathan Amzi as Babkak, Stephen Rahman-Hughes as Kassim and Rachid Sabitri as Omar. As previously announced, Trevor Dion Nicholas made his London stage debut as Genie. The special effects are created by Jim Steinmeyer, the master illusionist who helped David Copperfield. Aladdin had its Australian premier in Sydney at the Capitol Theatre on August 11, 2016, where it will play until February 19, 2017. Following performances in Sydney, Aladdin transferred to Melbourne in April 2017. Following the Melbourne engagement, the production will transfer to Brisbane and Perth. Australian native, Ainsley Melham, played the role of Aladdin, American actress, Arielle Jacobs, played the role of Princess Jasmine, and American actor, Michael James Scott, played the role of Genie in the original Australian production. The Sydney and Melbourne production also performed an autism-friendly adaptation of the show which had the "removal of strobe lighting and pyrotechnics, reduction of any jarring sounds and house lights being dimmed (instead of off)" in order to provide a more supportive environment for autistic patrons. Disney Theatrical will launch a North American tour at Chicago's Palace Theatre, where it is scheduled to play from April 11 to July 2, 2017. The Genie welcomes the audience to the middle-eastern city of Agrabah. He notes that Agrabah is a very diverse place, full of revered nobles, misfits, and even a few villains ("Arabian Nights"). Once inside, Aladdin is instructed to bring the magic lamp to Jafar and touch nothing else. Astonished by all the treasure buried within the cave, Aladdin attempts to take some gold coins along with the lamp. The cave angrily seals itself, trapping Aladdin inside. Engulfed in darkness, Aladdin rubs the lamp which to his surprise unleashes a magical Genie that offers to grant him three wishes. Aladdin initially shrugs this off in disbelief, prompting the Genie to display his powers with an impressive musical number ("Friend Like Me"). The Genie then reveals that he has limitations to his powers. He can't grant wishes that include murder, romance, revival of the dead, or wishing for additional wishes. Amused and overjoyed at his good fortune, Aladdin tricks Genie into magically freeing them from the cave without actually using a wish; thereafter, Genie states that Aladdin will not receive any more magic help unless he explicitly states "I wish". Genie muses that he would wish for freedom, since he is a prisoner of his lamp. Aladdin promises to free Genie as his last wish. Aladdin decides to use his first wish to become a prince in order to be legally able to court Jasmine (Act One Finale: "Friend Like Me"/"Proud of Your Boy" (Reprises)). A vast parade storms through the streets of Agrabah, led by Genie, Babkak, Omar and Kassim. They announce the arrival of "Prince Ali of Ababwa" ("Prince Ali"). Once at the palace, Aladdin, disguised as Prince Ali, expresses his desire to marry Jasmine to the Sultan. Jasmine overhears the conversation and perceives Ali to be just another shallow prince. Jafar, who is suspicious of Ali, tells him the location of Jasmine's bedroom, not mentioning that it is against Agrabah law for the Princess to have a suitor in her quarters unsupervised. Aladdin courts Jasmine with a ride on his magic carpet provided to him by Genie ("A Whole New World"). Once they return, Jasmine recognizes Aladdin as the young man whom she met in the marketplace. Aladdin lies and says that he really is a prince, he just sometimes likes to dress as a commoner to escape the pressures of palace living, much like Jasmine did that day. Seeing he isn't shallow and self-absorbed like the others, Jasmine kisses Aladdin good night. After she leaves, Jafar has Aladdin arrested for entering the Princess's room unsupervised. Upon hearing the news, Babkak, Omar and Kassim storm the palace to rescue their friend ("High Adventure"). They are captured and thrown into the dungeon as well, but with a little help from Genie, Aladdin uses his second wish to free them ("Somebody's Got Your Back"). As the Sultan announces to the public that Jasmine is to wed Prince Ali ("Prince Ali" (Sultan Reprise)), Jafar appears and reveals Ali to be merely a common street rat named Aladdin whom the former then threatens to send to "the end of the road" if no one changes the latter's personality to meet his standards. ("Prince Ali" (Jafar Reprise)). Genie then enters with Jasmine in chains, saying that Jafar is now his master and that his first wish was to make Jasmine his prisoner. Jafar uses his second wish to crown himself Sultan, which Genie reluctantly grants. Remembering what Genie told him earlier about the limitations to his powers, Aladdin tricks Jafar into wishing for himself to become a genie so that his power will be unmatched. Genie grants Jafar's wish, and Jafar is sucked into a lamp of his own, bound to it for eternity. The Genie replaces the absent Peddler as the narrator for the opening of the show. Abu the monkey and Rajah the tiger are excluded from the show. Rajah the tiger is replaced by three handmaidens who serve Jasmine and give her advice. Iago is not a parrot, but is played by a real man as seen on stage. He is also arrested after Jafar's defeat instead of being dragged inside a lamp by his master when Jafar wishes to become a genie. Jafar's henchman, Gazeem, does not make an appearance in the show. Aladdin is given three partners named Babkak, Omar, and Kassim. He is also given a scene where he remembers his mother. The Genie makes fewer references to popular culture and instead is given a Cab Calloway-esque persona. Aladdin's second wish is used to free him and his friends from capture, not to stop him from drowning as it is in the movie. Jafar's first and second wishes are to keep Jasmine as prisoner and to be Sultan, instead of becoming Sultan or the most powerful sorcerer in the world, respectively. Jafar's banishment of Aladdin to a frozen wasteland, followed by the carpet's rescue of Aladdin, is cut from the show. The battle between Aladdin and Jafar turning into a giant serpent is cut from the show. (*) This song was cut from the movie, restored for the musical, but later re-cut from the Seattle production. The pre-Broadway production in Toronto received mixed reviews. The National Post review said "This Aladdin turns out to be the best ever stage version of a movie", praising its score, direction, choreography, staging, lighting, design, and altered characterisations. CHCH said "Artistically, this Aladdin is top grade. It will become a classic." The Globe and Mail reviewer gave the show 2.5 stars out of 4, however, saying that it was "strictly for the kiddies". 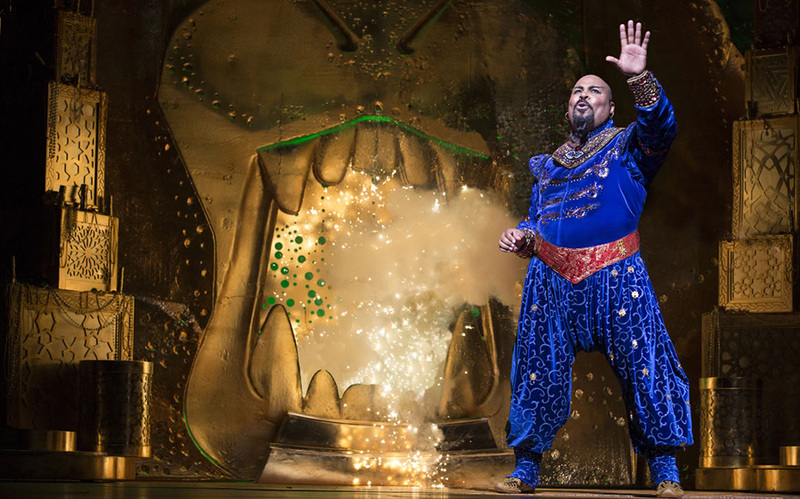 The Toronto Star gave the musical the same rating, and said "You're likely to hear the sound of deafening applause [during the] show-stopping staging of 'A Friend Like Me' and James Monroe Iglehart's blessedly bravura performance as the Genie. It's the kind of exhilarating moment we go to the theatre for. But ... nothing before or after it in Aladdin lives up to those six sublime minutes." The Vancouver Sun said "Director Casey Nicholaw has served up a thoroughly satisfying confection for kids, who will no doubt delight in the swords, smoke and spectacular tunes of Aladdin – and will leave the theatre content to have been transported to 'a whole new world'. Their parents? Maybe not so much." The website BroadwayWorld said "the show had the unbelievable sights but sadly struggled with the indescribable feelings", adding "The problem is, Chad Beguelin's book fails to make us truly care for the characters – and the special effects can only take the show so far when the investment at the heart of the story isn't making the connection it should. It felt as though the book concentrated too hard on adding cheesy 'current affair' style jokes ... and clunky one-liners instead of giving depth and material to Aladdin, Jasmine and the Genie." The Toronto Sun said: "In short, it's a visual assault that doesn't so much draw one in as simply sweep one up in an overly long first act . ... With the exception of Iglehart's gigantically genial Genie, there is no character in which an audience can make an emotional investment – no quiet moment that might allow any of the characters, good or evil, to exist in three dimensions." The Broadway production received mixed to positive reviews from critics. Mark Kennedy of the Associated Press gave the production a rave review, writing: "It's spritely ... well sung ... and hits that sweet spot Disney Theatrical Productions do so well, a saccharine fairy tale for the kids cut by some sly, vinegary quips for their parents." Elysa Gardener of USA Today gave the show 3.5 out of four stars and said, "If Disney Theatrical's latest production doesn't sustain that frenzied high throughout, it delivers a rush that may surprise folks who attend either as chaperones or to relive their own youths." Thom Grier of Entertainment Weekly gave the show a "B" and said, "Overall, this is one of the better Disney stage musicals, complete with several eye-popping production numbers that benefit from Nicholaw's spirited choreography, Bob Crowley's elaborate and chameleonic sets, and Gregg Barnes' glittery costumes." Terry Teachout of the Wall Street Journal praised Iglehart's performance, especially during the number "Friend Like Me" but wrote: "The trouble is that nothing else in the first act can touch it. Adam Jacobs and Courtney Reed, who play Aladdin and his princess, are pretty but bland, and the temperature doesn't start rising again until the magic-carpet ride, which comes after intermission and is the slickest thing to hit Broadway since the flying car in Chitty Chitty Bang Bang. From then on, Aladdin becomes fun". Charles Isherwood of The New York Times was mostly positive in his review, writing that "this latest musical adapted from one of Disney's popular movies ... defied my dour expectations. As directed and choreographed [by] Nicholaw, and adapted by ... Beguelin, Aladdin has an infectious and only mildly syrupy spirit. Not to mention enough baubles, bangles and beading to keep a whole season of RuPaul's Drag Race contestants in runway attire." Marilyn Stasio of Variety gave the show a negative review, commenting: "The magic-carpet ride is magical. The Cave of Wonders is wonderful. And yes, you'll hear the tunes you loved in the 1992 movie. But the notion that Disney Aladdin somehow resurrects the spirit of the late Howard Ashman, who had the original inspiration for the movie and contributed most of its clever lyrics, is a joke. Restoring a person's work without respecting his artistic sensibility is no tribute at all." Twisted: A musical parody of Aladdin, telling the story from Jafar's perspective.